Chick-fil-A is never open on Sundays. However, this Sunday, the chain sprang into action to prepare free meals for the thousands of passengers stranded after a power outage at Atlanta's Hartsfield-Jackson International. Workers "immediately mobilized" after Atlanta's mayor called the company to ask for assistance. Chick-fil-A broke one of its core rules and served fried chicken this Sunday. And, the fast-food chain had an incredible justification for doing so. On Sunday afternoon, Atlanta's Hartsfield-Jackson International — the world's busiest airport — lost power, causing more than 1,000 flights to be grounded. 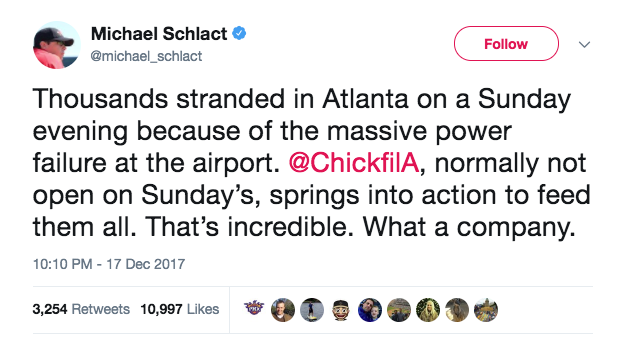 As hours went on without power being restored, the city of Atlanta turned to Chick-fil-A to help craft a solution. Atlanta's mayor, Kasim Reed, called Chick-fil-A at around 10 p.m. and asked for assistance, company spokesperson Amanda Hannah said in an email to Business Insider. Typically, Chick-fil-A is not open on Sunday, due to the founder's religious beliefs. 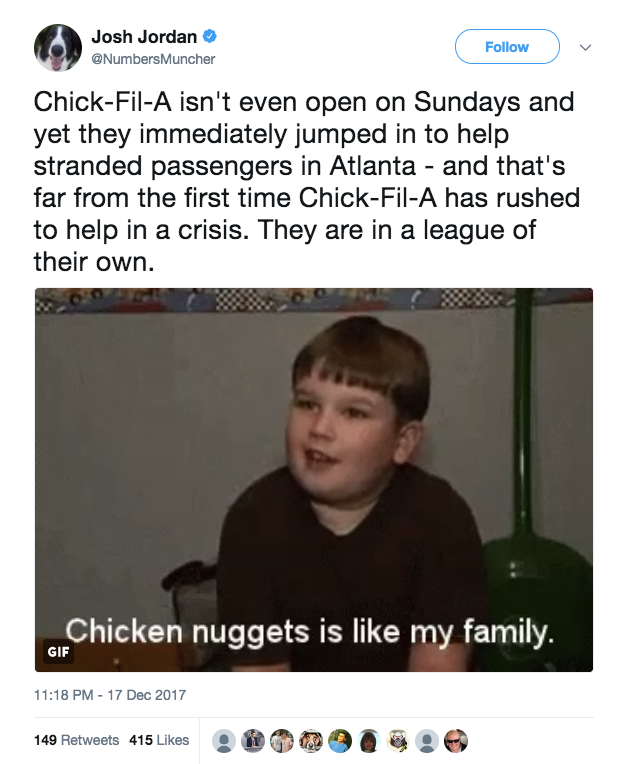 However, this Sunday, Chick-fil-A employees "immediately mobilized," making sandwiches and delivering them to the emergency operations center to be distributed to stranded passengers. "It has been a very difficult day for thousands of travelers," Hannah said. "And while Chick-fil-A is always closed on Sunday, our restaurants open occasionally to serve communities in need." Hannah continued: "We do not make a profit but do what we can to offer comfort to people experiencing hardship." People immediately celebrated the chicken chain's break from tradition. Power at was restored at Atlanta's Hartsfield-Jackson International minutes after midnight. According to Georgia Power, more than 5,000 meals have been delivered to stranded passengers.